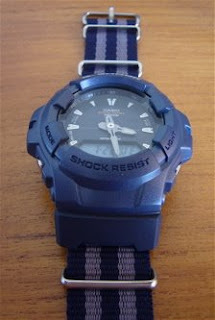 They did not have a full navy blue strap but offered me a 'Bond' design blue grey NATO strap instead. Great choice. I went with 22 mm instead of 24 mm. We will see why later. I had actually wanted to go with either the ZULU or MIL 1 piece series as I was worried if the watch would fit between the loops of the NATO strap. Took a risk on this. Here is the result. The blue grey 'Bond' NATO strap. 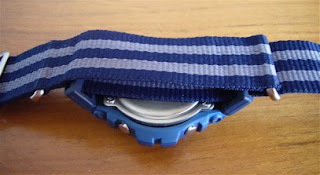 The old strap, or what is left of it. 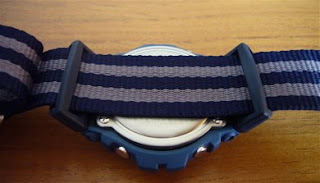 A closer view of the 2 steel loops, hallmark of the NATO design strap. Now to loop the strap onto the watch. Would it fit? Yes, and am very happy with it. I am also happy with choosing 22 mm instead of 24 mm as I did not want the edges of the strap to brush against the strap adaptors. Also less stress (?) on the adaptors. Fit just nice. The colour of the strap matches the watch as well. I like it. My first frankenshock, well second actually, but we will get to that in another blog entry. Overall, I like the strap as it is soft and not very thick. This is important to me as if the strap is not soft, it will not 'bend' to follow the contour of the arm when worn. This can put unnecessary stress on the strap adaptors. I am indeed happy with the purchase of the strap.